I did boldly name this caddis-fly larva, because of what I saw on a Russian sketch and a key table elsewhere. At first I thought this to be a Oxyethyra species, but those have more flask shaped cocoons. Later I found out in a Dutch book on this subject that this larva is indeed Tricholeiochiton. Strong indications: the short fore legs and the extremely elongated mid and hind legs. Watch him strolling like a micro T-rex on the picture on the right. 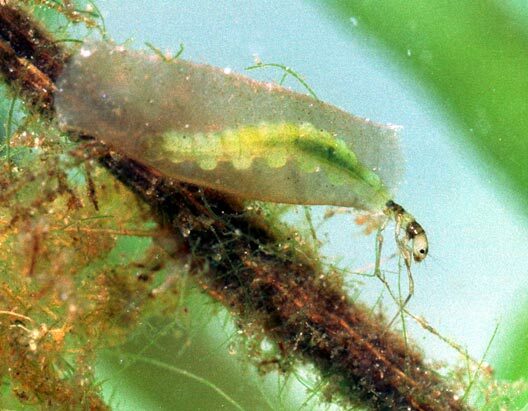 This is a genus of the somewhat special family Hydroptilidae within the Trichopterae order (caddis-flies). The family is distinctive in a number of things. They are called micro-caddis-flies because of their small size (a few millimetres). The cocoons are flat like a spectacle etui and are entirely made of their own silk without other material (there are some species however that cement very fine sand or small pieces of moss to it, and other that mix algae in it). In contrast with normal caddis-fly larva they only start building their cocoons after a few moults, and not before that they get their peculiar vertical flat shape. They feed on filament algae. 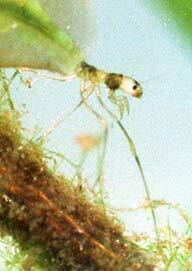 Some species of micro-caddis-flies spin silk threads between water plants, on which they walk with their clawlike front legs with surprising elegance.